As a Peace Corps Volunteer, I am encouraged to take on additional projects that are beyond the required minimum commitment of teaching a set number of hours per week in my assigned high school. For example, some volunteers organize summer camps, others work with local community libraries, and others partner with non-governmental organizations that work toward various goals focused on improving different aspects of society. Last spring, two such opportunities presented themselves in which I was asked to participate. 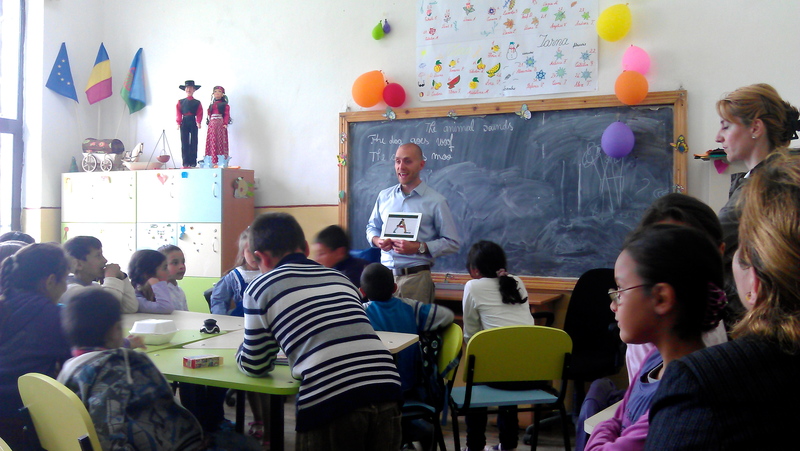 Both involved extra time in the classroom, but in different schools and in different communities outside of Valea Călugărească. At first, I was concerned about the added time commitment to my already hectic schedule, but I was almost immediately glad I had accepted the chances, as they have both been very rewarding. The first activity stemmed from another short-term event in which I was asked to participate. The Assistant Principle of my high school established and now manages her own NGO, the name of which translates to Young Volunteers. The self-explanatory organization title basically says it all, but the idea is to help encourage youth to become more engaged in their communities through volunteerism. Every year my AP tries to take a few of these local kids to Bucharest so that they have the opportunity to visit some of the museums that the capital city has to offer. Many of these students don’t have the money to do things like this; and, furthermore, some of them had never even been to Bucharest despite our relatively close geographical proximity (this is another activity that I was asked to participate in and for that matter ended up personally funding). Leading up to the museum fieldtrip, the AP asked that I give a talk on the important role that museums play in American society. The students from one school in the neighboring town of Bucov seemed enthralled, perhaps less in the subject matter than in simply having an American in their classroom. As we left, following my presentation, the school’s English teacher asked if I would be willing to visit once a week for a couple of hours at a time to help encourage the kids to learn English in a more fun and engaging way. By the time I was out the front door we had established a time for me to return the very next week. The students I worked with were in the eighth grade, getting ready to graduate from middle school and needed help preparing for their tests leading into high school. Their English level was much better than that of my high school students so I was able to do a lot more with them that was entertaining and engaging not only for them but also for me. We played games, did some creative story telling and helped develop their problem solving skills. At the end of the school year, and my last visit with them, they even expressed their appreciation and told me how much they’d miss our time together. These are certainly not sentiments that I receive from my high school students. Even though there will be a new group of students this next school year, I look forward to continuing my interaction with the school in Bucov. The second extracurricular activity with which I found myself involved was with an organization called the Roma Education Fund. This NGO was originally started in 2005 in Switzerland, then spread to Hungary and is now also in Romania. The organization’s mission is to help better integrate the Roma population into society and stem the tide of segregation and prejudice against them. The Roma people are traditionally nomadic, originally having travelled from parts of the Indian subcontinent, with their own Romani language classified as Indo-Aryan. In Romania, they are also widely referenced as Gypsy or Țigani, and have settled all throughout Europe; with no connection between the name Roma and the country of Romania. Every society seems to deal with challenges of this nature at one point or another; Romania has made great strides, but still has a way to go, based on my experience. Many Romanians whom I know personally, who could be described as educated, civically engaged and caring, are generally quite tolerant, that is until the topic of the Roma comes into conversation. It’s usually at this point that every fault of modern Romanian society is blamed in one-way or another on the Roma (less than 5% of the population). Thus the REF has a number of programs, which they use to help the Roma. 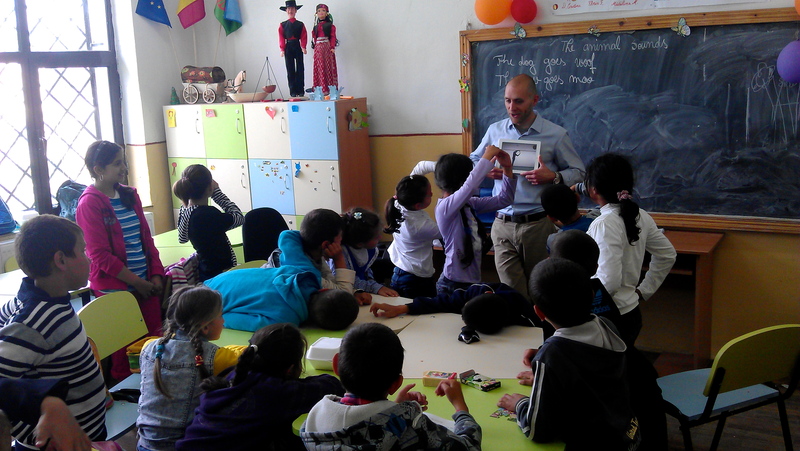 One such program works in conjunction with general schools to help keep Roma children interested and engaged in the educational process. They have asked volunteers, such as me, to work in an afterschool program with a mixture of students in order to keep them preoccupied when normal daily classes are finished. Assigned to the Roma village of Ciupelniță, my role wasn’t so much to teach them English, as it was to make learning English fun, and to keep them out of trouble in the afternoons. Being that these kids are mostly 1st through 5th graders, it also gave me the chance to step out of my normal comfort zone of teaching young adults. Before I knew it, I was singing and dancing while teaching about parts of the body, clothing, and numbers/letters. Although the whole experience was quite fun, it was almost as equally frustrating. During one period I was left alone with the rascals and had an impossible time keeping the volume down let alone maintaining their focus. My hat is off to teachers everywhere who do this day in and day out. The Peace Corps is smart to encourage Volunteer engagement in extracurricular activities. Not only is it great for our communities but it can also be a big morale booster and break up the monotony of routine. Each week, I found myself looking forward to the few extra hours I would spend with these other children. The higher-level of engagement I was able to experience with the kids from Bucov and the endless energy of the children from Ciupelniță certainly brightened my weeks this past spring. I look forward to keeping these extra activities going this next fall semester. After all, how could anyone not like hearing their name yelled with enthusiasm and excitement every time you walk through the classroom door?